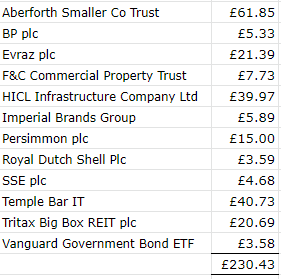 I received £230.43 in total, of which £221.52 was from my ISAs, the rest in my SIPPs. Bit annoying that I didn’t receive quite as much as last March but some end of month dividends weren’t received in my account in time for the update. A good month for both matched betting and each way (EW)betting, with total profits this month coming in at £859 (of which £421 was from EW betting). At one point, it looked like I was going to clear over £1k in profit but negative variance in the last few days meant it wasn’t to be. Still, I’ll be well happy if i have a few months like this! 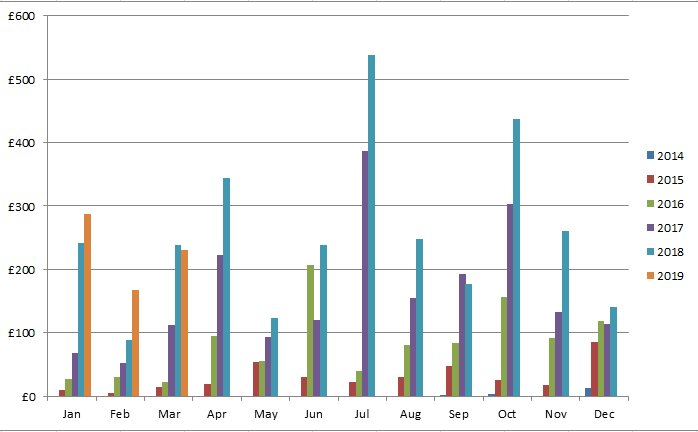 This month marks three years since I started MB – total profits in that time amount to £13,919. Not the huge riches that some others might have gotten in less time, but it’s a nice sum which I’m very happy with and I’m comfortable with how the hobby fits in with my lifestyle and with the levels of variance experienced with EW betting. As mentioned before, the MB guide I subscribe to is OddsMonkey*, which is great for beginners and experienced matched bettors alike with quality tools such as the Oddsmatcher, Each Way Matcher, Racing Matcher and Acca Matcher among others. There are step by step guides and also a friendly forum for you to ask questions and get help on any of the offers. Some people find Matched Betting tedious and not worth their time or effort, but you won’t know until you try it and for me, it’s the ideal ‘side hustle’ to do when I want to. Anyway, check out the free trial* (with no obligations). The big hike in savings rate still doesn’t push my average over 50% but it’s looking a lot better. 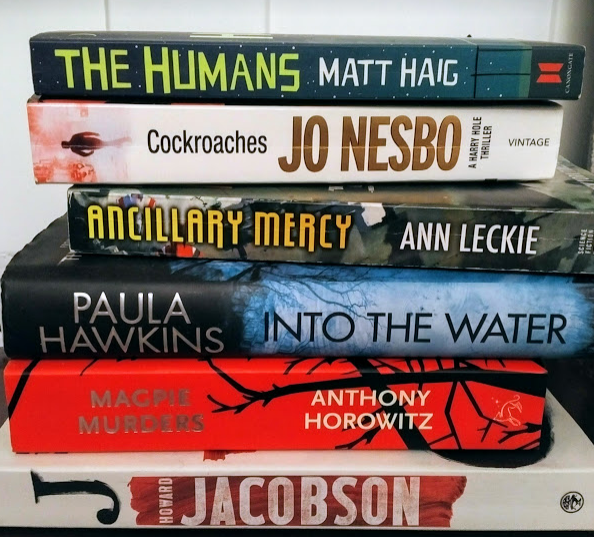 Since I’m not doing too badly on the library book front, I’ve been reading books which I own, so I can get them off my shelves and donate them to charity once I’ve read them. Some books off my shelves which I will read (in order). I’m now on the second one from the top. I already miss going to the library, so will hopefully just plough through these over the next couple of months. This entry was posted in Books, Dividend Investing, Earnings, Expenses, Investment Trusts, matched betting, Portfolio, Savings, UK Gathering by weenie. Bookmark the permalink. Shamefully underfunded and closing everywhere it seems but great (free) places to go especially for kids. Amazon may want them all shut down ti remove unfair competition! On the topic of filling isa allowances. 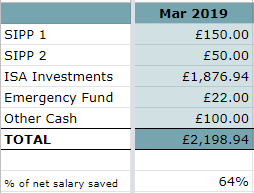 If you might fill next tax years up (with a good run on matched betting perhaps) it might be worth using your (arranged) overdraft to pay in before the end of the tax year and repay the debt asap. It is not the first way ti do it but there’s a case for borrowing short but high to invest long and low (tax). Yep, I love libraries. One of the charities I donate to is a library I use to be a member of (I no longer live in that area), which was shut down by the council but which was ‘saved’ by the locals and is kept going purely by donations and volunteers. I hear what you’re saying about borrowing short term but I dislike going into my overdraft because I still (painfully) recall when I was never out of it. Something to consider anyway to max out the ISA, I guess. We got a couple of Matt Haig’s books from the library as audiobooks, love them. The Future Fund growing by more than you add must be a great feeling! Thanks A Way To Less and yes, my FF growing my more than I’ve invested is a great feeling! It’s the first Matt Haig book I’ve read and I really enjoyed it – do you have any recommendations? ‘Notes on a Nervous Planet’ is great, would definitely add that to the list! We also just picked up ‘Reasons to Stay Alive’ so will see how that goes! You’re currently 1 book ahead of me this year, I’m starting to fall behind as I’m reading two books at once 🙂 I’ve got a short story on my ‘next-up’ shelf, so I should be able to catch up! Amazing matched betting profit total, matched betting profits are soon going to cross 10% of your net worth which is incredible! But unlike you, I can’t read more than one book at a time, unless one was non-fiction and the other fiction but even then, I don’t like to split my concentration like that! I know, those MB profits are at my lowly stakes, think what yours will be like after a few years – they’ll be MEGA! Thanks Rhino – hope you’re well. An extra £5K/year is not to be sniffed at! How much time do you estimate you spend on MB a week? Exactly, all tax free too! I reckon I spend anything from 4-7 hours a week on MB, it depends. It’s not like I have to clock in – if I’m too busy doing other stuff, then I do less. If I’ve got a day off/free time, then I do more. That’s a very good hourly rate! Do you bet on any sports in particular? 100% sports betting of which 99% football and horse-racing, 1% the odd tennis or golf offer. That looks like another great month, and over £13k from MB in three years is pretty amazing! I know what you mean about wanting to get back to the library. For various reasons I ended up working at our local library for half a day last week and it was so nice.I tend to spend 5-10 mins there every month or so usually and there was something very satisfying about spending hours surrounded by books. Hope that you manage to get back there soon! I’ve always wanted to work in a library and I’m hoping there will be an opportunity for me to volunteer in the future. Totally agree with you about the being surrounded by books feeling! There are some great guides on EW betting around if you want to dip your toe in but it’s very much a long term game, like investing in a way. Some people start with very small bets to see how it goes. Look forward to reading your post on MB. You might as well err on the side of risking leaving yourself short. If you end up needing to withdraw something (i.e. wasting some allowance) it’s not as if you wouldn’t have lost the allowance anyway with the end of the tax year. I’ve conditioned my mind to treat my ISA as part of my Future Fund so only really to be spent when I’m no longer working so withdrawing from it (even if it’s my emergency fund) doesn’t sit comfortably with me. I know it sounds daft but it’s psychological! I did put some last minute £££s in before the midnight deadline so did as much as I was comfortable with. Hoping to do better this tax year! Great numbers Weenie!! I started EW betting in March, and numbers weren’t too shabby at all. I joined the library as well – what an amazing place to be. I see loads of people using it as a work space. So if I get tired of working from bed (he he) I’ll head there. Great to hear that you started EW betting and you’re seeing good results – let’s hope the good run continues for you! And yes, libraries are amazing places – hadn’t thought about them being places to work in, although I have used the internet services before though not for work. Sounds like a good place to go, when you can get out of bed, haha! Really must give matched betting a try. I’m not sure it’s for me, but as you say, you won’t know until you try. I think it’s the time investment it takes to learn how it all works that is causing me to procrastinate. I just want to fast forward to a time when I can idly do it whilst watching the telly. Some people try matched betting and kick themselves for not trying it earlier. Others, might think it’s too fiddly, too time consuming. The only thing I can recommend is to try it and see for yourself. And yes, I do my MB either while watching the telly or listening to podcasts (the only time I seem to be able to listen to podcasts as my attention drifts otherwise). If you do try it and need help, drop me a DM on twitter if you have any questions. Ok, i have to admit that i was completely hoodwinked by that bad man Pete over at MMM and his April Fool joke, although in my defence i didn’t read his post until the 5th so wasn’t on high alert. Also, over the years i’ve come to fully trust all of his comments and i guess had become subconsciously programmed to always take him at his word. It’s a good lesson learned and a reminder that i need to think more for myself. So, when i then read about this mythical 64% savings rate this month i was instantly on high alert. The date checked out as well, so an obvious hoax. But of course, it wasn’t. From what i can tell, this site has always contained honest comments which is one of the reasons (interesting posts and not too high-brow, being others for me) why i continue to follow. Keep up the good work, and not that you need to, remember you have a responsibility to some of your more easily led gullible readers like me! Oops, I didn’t even think of the date as I was posting my higher-than-usual savings rate!